Disney’s biggest animated movies were released in the 1940s and 50s, when the studio that Walt built brought such colorful animal-themed classics as Dumbo (1941), Bambi (1942), and Lady and the Tramp (1955) to the screen. After One Hundred and One Dalmatians (1961), Disney saw a lull in animation that lasted until 1989, when The Little Mermaid made the expensive craft an immensely popular cash cow again. One Disney animated film to hit screens during the down period was The Aristocats (1970), a box-office hit that also saw a successful 1980 theatrical re-release. A light-hearted romp that features family of cats set to inherit a fortune from their aged opera-singer owner — if her devious butler doesn’t do them in first — it was the last movie Walt Disney approved for production before he died in 1966. 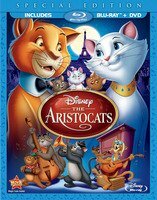 The Aristocats made its debut on Blu-ray this week in a two-disc restored Special Edition that also has a standard DVD version of the film. In addition to the feature film, a host of goodies are included, such as a deleted song, a music video, and the animated short, Bath Day. The MSRP is $39.99, but it can be found for a lower price at bix-box retailers like Best Buy or online at Amazon.com. Also available this week in a similar BD/DVD Special Edition are Lady and the Tramp II: Scamp’s Adventure (2001), a direct-to-home-video sequel of the beloved 1955 classic, and The Rescuers/The Rescuers Down Under, a collection of the 1977 movie and its 1990 sequel. Scamp and Rescuers each retail for $39.99 and they too come packed with extras.